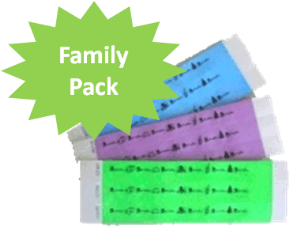 Green 20 family pack of disposable identification wristbands including a water resistant marker and resealable pack. Ideal for busy airports, shopping centres, shows and excursions. Simple to use, lightweight, strong and a bit of fun. Made from Tyvek, they are tough enough to handle the bumps and thumps of any active young child. They cannot easily be removed by small hands. The contact details you choose to write on the band are kept securely out of sight on the inside of the band. Can be used on either the wrist or ankle - 25cm long x 2.5cm wide & adjustable up to 22.5cm. A new band can easily be used with contact details everytime you change location while travelling. They are versatile and handy to have just in case. Keep a pack in your car, travel bag or carry-on luggage so they are always ready to go when you are! 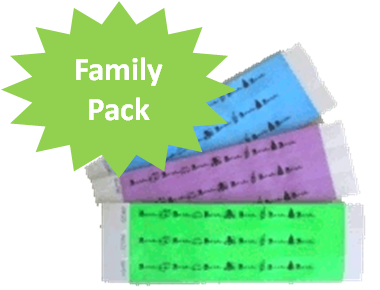 Silver 20 family pack of disposable identification wristbands including a water resistant marker and resealable pack. 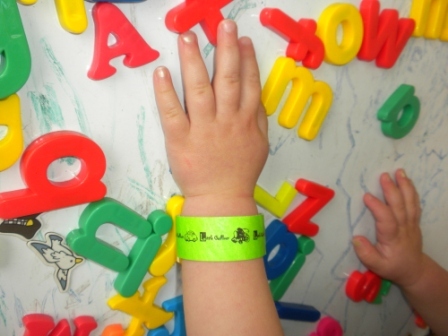 Group pack of 50 disposable identification wristbands including a water resistant marker and resealable pack. Ideal for kindergarten groups, excursions, parties and any fun gathering of youngsters!